A fake-news story about large-scale clashes between pro-Russian and pro-Iranian factions in Syria is making jitters in English- and Russian-language mainstream media outlets. 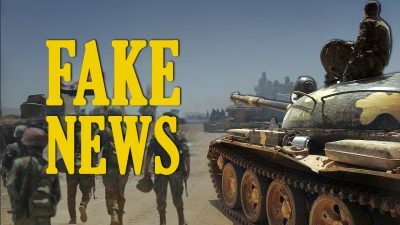 According to these reports citing anonymous sources and each other, “the pro-Russian Tiger Forces and 5th Assault Corps” clashed with “the pro-Iranian 4th Division” near the villages of “Shahta, Bredidg, Innab and Haydariye” in northern Hama. Most of the reports claimed that there were casualties among the sides providing “precise” numbers varying from a dozen to 200 fighters from the both sides. No source was able to provide details into how clashes had started but the versions are varying from “some differences” to “a campaign to limit Iranian influence”. Most of the media outlets presented these reports as some kind of breaking news. However, in fact, this is a week-old story. First such reports appeared in several pro-militant social media accounts and a local media outlet, al Modon Online. Later this rumor was reposted by anti-Assad, anti-Iranian and anti-Russian bloggers also citing anonymous sources to show the story look more reliable. By January 29, this rumor has reached large mainstream media outlets, but no evidence has appeared to confirm this kind of developments. However, the lack of factual data was ignored because this story is contributing to the US-Israeli-backed media efforts designed to undermine cooperation between Iran and Russia or at least to show that there are significant tensions between the sides. The similar situation was observed in 2018 when various mainstream media outlets and even top US leadership like President Trump and Secretary of State Pompeo were claiming that “hundreds” of “Russian fighters” were killed by the US-led coalition in the province of Deir Ezzor. Both of these stories demonstrate how media forgery could reach the wide international audience and start being repeated as facts despite zero evidence supporting them. On January 27, Russian forces launched at least three surface-to-air missiles at unidentified aerial objects near the Hmeimim airbase. According to local sources, at least 3 UAVs apparently launched from the Idlib de-escalation zone were intercepted. The Syrian Arab Army deployed reinforcements at frontlines near the Idlib de-escalation zone and carried out a series of artillery strikes on militant positions in northwestern Hama and southern Idlib on January 28 and 29. The US-backed Syrian Democratic Forces continue to claim dozens of casualties among ISIS members in the Euphrates Valley. However, a few remaining ISIS positions remaining there are still not captured.